I guess you could say that I was captured, maybe even intrigued, by the haunting quality of Johannes Vermeer's artwork, "The Girl with a Pearl Earring". 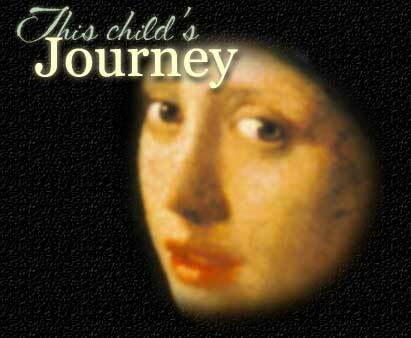 I wanted a woman's face as part of the title for This Child's Journey but as I couldn't use my own, I went in search of someone else's face, something realistic and warm. A painting was preferable, I thought. And during an exhaustive online search, I came across this face. At first, I only used her eyes (before I ever considered a splash page), concealing her turban and veil and the pearl earring, for she was someone - to me - who saw everything. I only wanted the eyes. Nothing was said, but she saw everything. That was part of the haunting quality. Later, when this splash page was commissioned, using the same artwork, it was decided that her slightly opened mouth would be revealed as well. No more secrets. Why do I keep going back to this image? I'm not quite sure. I know that I enjoy Vermeer's paintings and if truth be told, I only found out about him, or his name became well-known to me, after I came across "The Girl with a Pearl Earring" in 1999. It's a lovely painting, there's no doubt about that. And as much as I am drawn to the painting, I still can't bring myself to read the novel nor watch the movie about this very painting. Would it spoil the illusion? What illusion? I don't know. She sees. And there are no more secrets. Maybe that's just something I still want to hold on to. And I found her at a time when I wanted something special to grace the front page of my website. So not only is it a lovely painting, it's also a painting that holds a special place in my heart. I admit it, it does. And I do hope to see the original (as well as Vermeer's other works) for myself one day. I really do. Kindly note that this is not a linkware site and all graphics are the property of the respective artist or "This Child's Journey" and may not be used without first obtaining permission from the artist. splash page image created by "Ink2Art"
and uses Java and DHTML that will not work on out-of-date browsers.